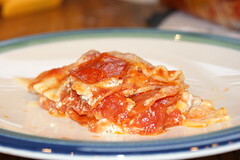 Cook lasagna noodles as directed on package and drain. Preheat over to 350 degrees. Spray 12x8 (I only have a 8X8 so I used that instead) glass baking dish with cooking spray. In saucepan, mix pizza sauce and tomatoes. Cook until throughly heated. In a small bowl, mix ricotta cheese and Italian seasoning. Spread ¼ cup pizza sauce mixture in bottom of baking dish. Arrange 3 cooked noodles over the sauce. Spoon and spread half of the ricotta mixture over the noodles. Top with ½ cup of the mozzarella cheese, 1 cup sauce mixture, ⅓ each of the pepperoni slices. Repeat layers once. 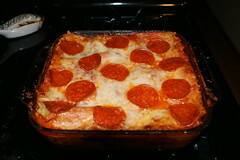 Top with remaining noodles, sauce mixture, mozzarella cheese, and pepperoni slices. Bake uncovered 30 - 35 minutes or until bubbly. Let stand 15 minutes before serving. I am always looking for quick food recipes. This is one of those! Who doesn’t like a ravioli recipe? Cook ravioli as directed on the packaging. Drain and set aside. In same saucepan, mix pasta sauce and basil. Cook over medium heat for about 5 minutes until heated. Stir in ravioli. Pour into ungreased 13x9 glass baking dish. Sprinkle cheese over the top. 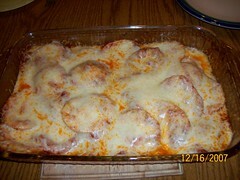 Bake uncovered for about 10 minutes or until sauce is bubbly and cheese is melted.